The Neues Rathaus is one of the best places to take wedding and engagement photos in the Hannover, Germany area. Like the US Capitol in Washington, DC, Hannover’s city hall is an indelible part of its city’s skyline. The Rathaus’s cathedral-like appearance is instantly recognizable to residents of Northern Germany. Its ornate green dome and graceful towers are as iconic to Hanoverians as the Washington Monument’s spire is to Washingtonians. As DC wedding photographers, we understand how famous buildings can enhance images of fiancés and newlyweds. We live in a city of internationally recognizable monuments and memorials! Obviously, having the Neues Rathaus as a backdrop in couples portraits gives the resulting images a distinctive “Hannover” character. For that reason, we always happy when our Northern German wedding and engagement clients suggest the building as a venue. For our parts, we frequently recommend it as a location to recently engaged twosomes looking to do portraiture in Hannover. Our connection to and love for the building goes far beyond its suitability as a venue for weddings and engagements. Though a Washington, DC, wedding photographer, Anji is a native of Hannover. As such, she has always felt a deep connection to the most iconic part of the city’s skyline. She still remembers going to visit the Neues Rathaus with her grandparents as child. She recalls gazing up with wonder at its beautiful exterior. So every time she returns to the Neues Rathaus, she feels a renewed bond with the city of her birth. The Neues Rathaus’s history is fascinating and another big reason why it is Anji’s favorite building outside of Washington, DC. The edifice’s construction was completed in 1913, making it Hannover’s “new” city hall. Its name translates as that, in fact. We always chuckle a little at that designation. For an American like Pete, 1913 does seem very recent at all. His home state of Minnesota was not even admitted to the United States until 1858! But as we are frequently reminded, the length of European history is measured on a completely different scale. For example, we attended Hannover’s 775th birthday celebrations a couple of years ago. To put that in perspective, Hannover was already more than 500 years old when Washington’s oldest building went up! Though we are DC wedding photographers, we have done more wedding and engagement shoots at the Neues Rathaus. Over time, we have learned that it offers more from a photographic point of view than just a beautiful exterior. The building’s interior is equally gorgeous. It has a lot of little nooks and crannies that create a sense of intimacy between two fiancés. There are lovely “windows” in the city hall’s ornate spiral staircase, for instance. We put windows in quotes because there is no glass in those spaces. The are simply tall, narrow openings in the side of the stairwell that look like windows. In any case, those portals can serve as a natural frame for couples in portraits. They do a great job of drawing the eye to them instantly in the final images. 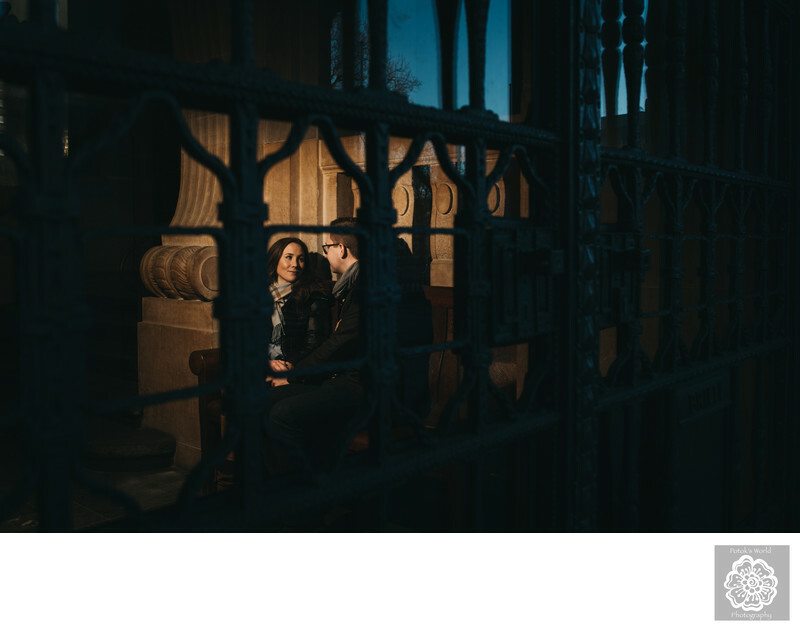 The engagement photo session at the Neues Rathaus featured was a lot of fun, thanks to this couple. The bride-to-be was a city employee, so we had more freedom to wander the building. That allowed us to find new creative spots in which to photograph the fiancés. For this picture, for example, we had the couple sit on a bench near the building’s entrance. We then went outside to shoot through one of the Neues Rathaus’s windows. This further heightened that sense of intimacy that we love creating in our DC wedding photography. It did so by giving the impression that we had happened upon two lovers sharing a private moment. In our professional opinion, shots like that make for compelling and memorable wedding photos! Location: New Town Hall, Trammplatz 2, 30159 Hannover, Germany.